The Call of Duty World League is one of the world’s largest eSports tournaments. With a prize pool totalling more than $4 million for the 2017 season, it also stands as one of the most lucrative events in pro gaming. Held annually to coincide with the release of every new Call of Duty video game, the CWL stands as a tour de force for the most competitive first-person shooter on the market. So what is it about the tournament that makes it so special, and why do so many people tune in? Let’s take a look at the history and future of the Call Of Duty World League. Many of the world’s best esports betting sites regularly offer betting markets on Call of Duty World League events. The upcoming 2018 season has more fanfare, funding and popularity than its first two efforts, so be sure to join in on the discussion at Esportbet and keep us bookmarked for the latest match updates and betting guides. If you’re new to betting online, please read our how to bet on esports guide to learn how to place a wager on your favourite Call of Duty pro gaming matches, and how the odds and betting types work. Readers from United States are recommended to check out BetOnline or any of the highest-rated sites listed in the table at the top of this page. More detailed esports betting site reviews can be found in our best esports betting sites guide. 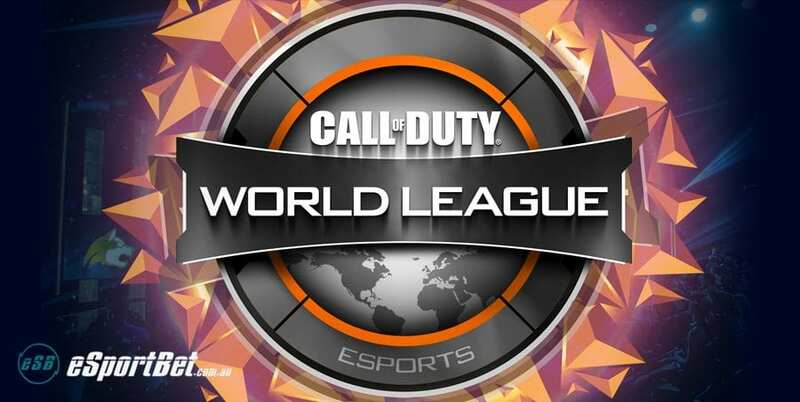 The Call of Duty World League kicked off its first ever season in January 2016, with Call Of Duty: Black Ops III on PlayStation 4 acting as the tournament’s game. It acted as a qualifier for the Call of Duty Championship, which hosts the world’s best teams and players, who battle it out for ultimate CoD supremacy. The prize pool started off at $3 million, half of which was designated for the Championship at the end of the season. The Championship has existed since 2013, with the first game being Call of Duty: Modern Warfare 3, played on Xbox 360. Microsoft had a long-standing relationship with the franchise and eSports leading into this generation, however Call of Duty publisher, Activision, teamed up with Sony and PlayStation, and pro Call of Duty tournaments have been on PlayStation 4 since 2014. The games played so far have been Call of Duty: Ghosts, Call of Duty: Advanced Warfare, Call of Duty: Black Ops 3, and Call of Duty: Infinite Warfare. The tournament acts as a qualifier for the Championship, with regional qualifying events and online qualifiers for the League itself held at the end of the year prior. Teams that make the League then compete for a place in the Championship, which takes place before the launch of the next Call Of Duty in November. There are two divisions: the Pro Division, and Challenge Division. The Pro Division is hosted across the globe at tournaments in North America, Europe, and Australia/New Zealand. The structure of these tournaments is different depending on the amount of teams competing, and all take place before the Championship. Nine teams from North America, six from EU, and one from APAC are placed in four groups, with placement dependent on how many points they earned during their respective regional qualifiers. The top eight teams will make it into the Stage 1 Playoffs, while the bottom four teams will compete in a relegation battle. At this point, new teams can compete for a spot in the Pro League in progression to Stage 2. The winners of the relegation battles will join the Stage 1 top teams in the second round, which ends with eight teams competing for prize money and seeding. Once a team makes it to stage 2, they are granted automatic inclusion in the Championship in June. The Challenge Division acts as a qualifying for up-and-coming players, who can compete against similarly-skilled players for a place in the Championship. These qualifiers are LAN events, offer a prize pool albeit a smaller one compared to the Pro Division. Each competitor plays to earn World League points, which are then used to work towards a place at the Championship. In the Call of Duty World Championship, 32 teams battle it out across multiple pools. 16 of the teams come from the Pro league, while the remaining 16 are made up of winning teams from the qualifying LAN events and regulation battles. The 2016 League had a prize pool of $3 million, which has now been bumped up to $4 million for Season 2 in 2017. The World Championship was kick-started in January 2016, with excitement high for the newly formed Call of Duty tournament. However, things got off to a rocky start when the PlayStation’s online network crashed, forcing a delay to the start of the event. It eventually got started a few days later, and lasted 11 weeks across regional events in North American, Europe and Australia. The Australian regionals competed in March for a prize pool of $118,000, which at the time was one of the largest in Australian eSports qualifying history. Mindfreak beat out Tainted Minds to take home $44,000. In Europe, Millenium beat Splyce 4-1 to win $52,000, while in North America, eight teams battled it out for a stake in the $218,000 prize pool. Optic Gaming beat Rise Nation 4-3, winning $66,000. Splyce would have the last laugh, however, making it all the way to the final in the Call of Duty World Championship. They would lose to Team EnVyUs, while Millenium struggle to make to top four in the tournament.